Cue Kanye. Today, we’re going to talk about power. Certain exercises are perfect for focusing on how much “power” we can create, and we’ll discuss why those are so beneficial to include in your workout. First, ask yourself, What is power? pow·er:ˈ the ability to do something or act in a particular way, especially as a faculty or quality. The secret success of “power” work is the ability to rapidly relax. That’s right. Power work can help us practice relaxing as quickly as possible. Let’s consider the order in which this happens. Before we begin practicing power, we’re relatively inefficient at moving. Imagine a car that has a lot of friction in the transmission, or having to turn on each lightbulb individually. When we practice our power work, our brain quickly realizes that it has to work harder to coordinate all of the muscles involved in the activity. Rather than working overtime to coordinate, we learn to sequence things better. Our transmission runs more smoothly, and we install a light switch that turns on all of the lights in the room at once. We’ve streamlined things. Just how this happens is loosely exercise specific. Throwing a ball or swinging a bell won’t automatically make you better at other activities, but there is carry over from activities in the gym to activities outside of the gym. Let’s consider some of the exercise that we do that feel powerful. Okay, so not this one. Do not do this one. I got carried away. Before we talk about what to do, I’d likely to quickly touch on what is not power work. For simplicity, let’s make generalization: If it’s more than 3-5 reps, or 10-15 seconds, it’s not power work. Some of my pure performance friends may think even that is too long. To be certain, here’s what I’m trying to avoid: Just because an exercise makes you feel powerful, doesn’t mean that it’s power work. Emotionally, it’s great, but physically… not doing what we’re looking for. As someone who’s really excited about mountain biking, I know that there’s a focus on “power” in endurance sports. If we’re using GPS, power meters, heart rate monitors, we track “power.” This version of “power” is entirely different from what we’re currently talking about. We’re still working hard, but it’s ultimately not the same. The power that we’re focusing on is very short, very high levels of intensity. What’s the fastest you can move something in a very short period of time? Think of jumping, skipping, throwing, or swinging. These are the moves that teach us to really get on the gas. Here are two examples, each focused more on the lower body or upper body. Check out a power swing, or a half-kneeling medicine ball slam. During each of those exercises, there are moments of intense action. The hips explode forwards, or the shoulders snap down. When we regularly generate high levels of force, we get better at it. When improve our powerful we can be. We also learn when to not be powerful. Spending the entire day engaging the abs, or engaging the glutes, is a surefire way to burn out our brains and feel silly. Walk around while consciously squeezing your glutes, and people are going to direct you to the nearest bathroom. We want to be “on” when we train, but it’s best to be relaxed for the rest of the time. Relaxed when we’re resting and away from the gym, but ready to do work when we’re there. To find that “off” switch, my favorite strategy is to really crank up the intensity of the “on” switch. Expanding our awareness of how hard we’re working is important in the gym, but far more practical for living our best life outside of fitness. 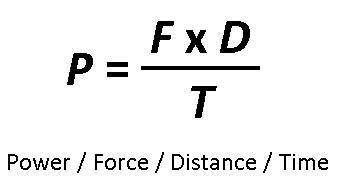 Rate of force development is important in athletics and longevity, but the real secret success of power work is how it helps us relax. Find what you can hit hardest and all of a sudden you can relax that much more. That may be for a few seconds between reps, a minute or so between sets, or best of all, in the hours and days between hard workouts. Remember, this means you have to really get after it when you’re training, and with that, you’ll unleash the ability to relax as much as you want. Previous PostPrevious Is It Good That My Muscles Are Sore?